The Chubby Charmer Bag pattern is designed by Penny Sturges and makes up into a great big bag for carrying everything around, including bathing suits and beach towels. 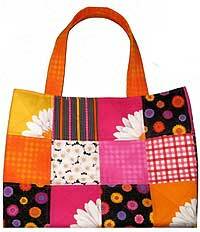 This bag pattern can also be used as a 9" x 13" casserole carrier! Finished size is 14" tall x 18" wide x 10" deep.